Oscar and Felix met their untimely deaths on the floor of my living room. For a couple of years, my family lived in northern Virginia. My parents commuted into Washington D.C. and on the weekends we were able to take great advantage of all that the area had to offer. One of those items was the National Aquarium. We never had fish, tadpoles, lizards or any other kind of creature that we kept in a glass box, so I really didn’t have much experience with any of them. I remember entering the aquarium and seeing snakes (big ones, colorful ones), toads (even more colorful), lizards (some cute, some not-so-much) and then we got to the sea creatures. The angel fish were cool and the lion fish were even cooler. I saw rays and the first live sharks I had ever seen (they were nurse sharks but looked plenty deadly to me). I recall the tank that held the oscars. They had a half a dozen of them and they were not just big, they were huge. These big, ugly fish sailed gracefully through the water. Shortly after that my parents surprised my brother and I with an aquarium and two little fish. They were oscars as well. After a very short debate, we named them Oscar and Felix (for those unfamiliar with the reference, see The Odd Couple) and after an initial excitement of watching them, they pretty much faded into the background (unless you were feeding them). At the time we had a large console TV that was set in a large piece of wood furniture. The advantage to that was a nice, broad, flat top that things could be set on. That is where the aquarium went. One day my brother, dad and I were fooling around in the living room. My brother and I set upon my dad and attempted to pin him in wrestling. We were young, but growing and the combination of the two of us was a good match for him. At one point my brother was on my dad’s back and when my dad reared up, my brother stumbled back towards the TV. His elbow came in contact with the side of the aquarium and hit it just right. Or maybe, just wrong. The glass broke and gallons of water poured out, taking poor Oscar and Felix with it. We scrambled to capture some of the water and get the fish but as we did we started to realize that our enjoyment of the fish was minimal and it was unlikely that we would get another aquarium. So Oscar and Felix passed away and were buried at sea (well….a flush of the toilet anyway). This is such a beautiful dish to photograph. It was pretty good eatin’ too! I made a really big amount of this as we were having guests over. 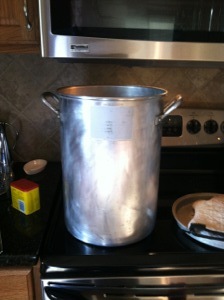 This is my turkey deep fryer pot. It is the right size for the boil. The other advantage to using the pot is a strainer pot that slides inside. It makes it easy to pull the food out of the “boil” liquids. If you love Old Bay, you have to give this summer staple a try. 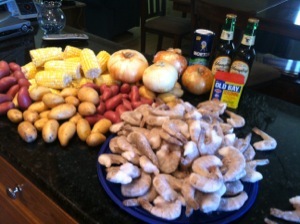 1 In an 8-quart stock pot, bring Old Bay, salt, water and beer to a boil. 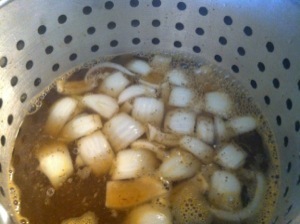 2 Add potatoes and onions; cook over high heat for 8 minutes. 3 Add smoked sausage; continue to cook on high for 5 minutes. 4 Add corn to pot; continue to boil for 7 minutes. 5 Add shrimp in shells, cook for 4 minutes. 6 Drain cookin liquid; pour contents of pot into several large bowl or shallow pails. 7 Sprinkle with additional Old Bay. Poor Oscar and Felix 😦 but oh YUM to Old Bay Shrimp Boil! We made at a picnic this summer and LOVED!!!!!!! Please! Please. Stop posting these sumptuous photos! 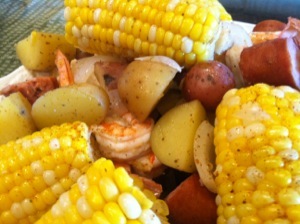 Excellent Low country boil! I can’t wait to try this. Too bad about Oscar & Felix though. I would kill to try this! 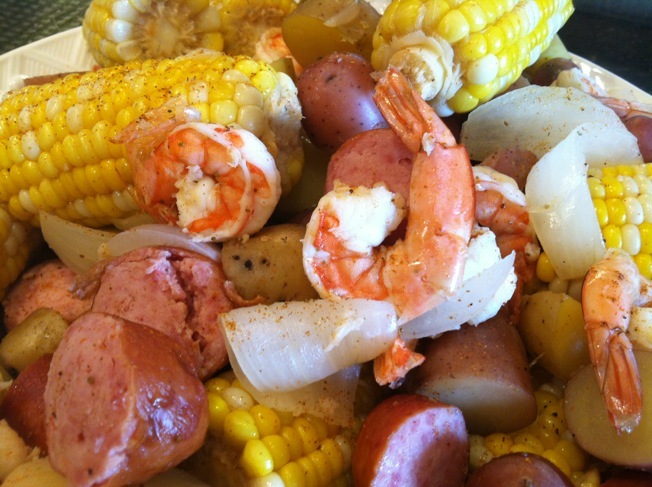 Where can you find old bay seasoning? i can’t find it anywhere. If your local grocer has a seafood section, it might be hiding out near there. I can also typically find it in the spice aisle. thanks, that is what i have doing….i will check again!